The Ivy Tech Libraries of Central Indiana are sponsor the annual poetry contest each February - April. All winning entries will be published in a future edition of New Voices: Ivy Tech's Student Literary Journal. For more details, please see the Rules section of this guide. 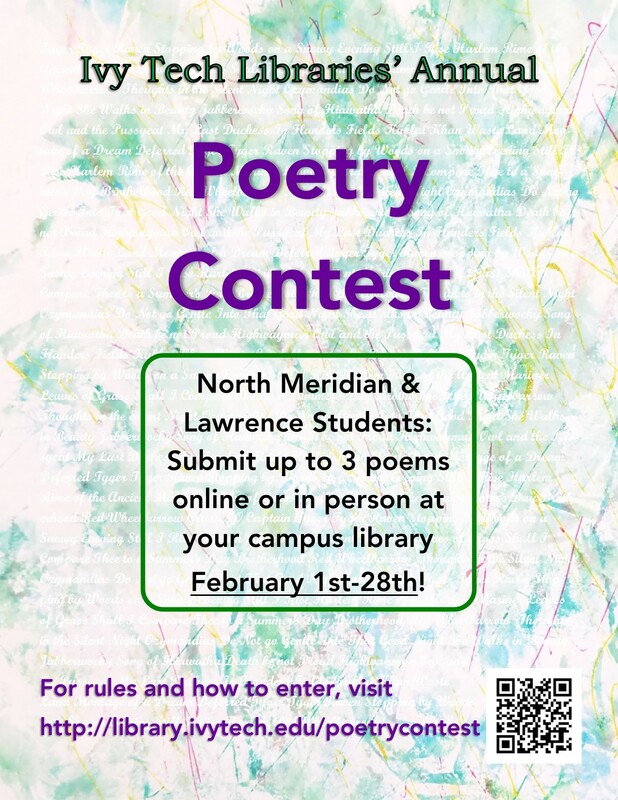 The annual poetry contest is open to students currently enrolled at the Indianapolis-North Meridian and Lawrence campuses. Poems will be accepted until Thursday, February 28th, 2019. Participants are allowed to submit up to three (3) poems for judging. Any style of poetry is welcome. All poems must include the poetry contest cover sheet found at the library or on this page, and be typed in a Word document. Entries may be submitted electronically or in-person at the NMC or Lawrence libraries. To submit the poems in person, print each poem and bring it to the NMC or Lawrence library. Each poem should not contain any identifying information. Instead, staple the accompanying cover page with identifying information to each poem. Please use at least a 12 point font. *Ivy Tech reserves the right to reject submissions with inappropriate content based on the Student Code of Conduct. Click here for the required contest cover sheet. If you're not sure about your submissions, there are examples below. For example, if you have three poems, there will be 4 attachments to your email: the filled out cover sheet, poem 1, poem 2, and poem 3. After 40 years of service at Ivy Tech, Michael Clippinger retired in July of 2014, at the rank of F-5 Professor of English and the position of Assistant Vice Chancellor of Academic Affairs. He had served, on two separate occasions of transition, as Interim Vice Chancellor of Academic Affairs. Michael earned a double master's degree in English and creative writing from Indiana University-Bloomington. After four years at Western Illinois University, teaching composition and English courses, he joined Ivy Tech in 1974 as instructor of writing. He taught a broad spectrum of English and composition courses at Ivy Tech, as well as writing and communication courses for business, industry, and union apprenticeship programs in Central Indiana. As an adjunct faculty member at IUPUI for a number of years, he taught composition, and more recently, honors creative writing. In the early years at Ivy Tech, he oversaw the developmental education program and the creation of the developmental writing program; he also created and taught in the ESL program. He has participated in numerous regional and statewide initiatives at Ivy Tech and for Indiana K-12 public instruction in English. He was fiction editor for, and contributor to, the Western Illinois University literary publication and also a member of the editorial board of the the Literacy Letter, a publication of the Indiana Literacy Coalition. He has served as a judge for the National Council of Teachers of English Achievement Awards in Writing. Michael has written a variety of articles, short fiction and poetry, a number of which have been published. Judith LaFourest is a professor of English at Ivy Tech Community College in Indianapolis. She holds a B.A. and a M.A. from IUPUI, both in English. LaFourest received the Distinguished Alumni Award from IUPUI School of Liberal Arts in 1980. Nayt Rundquist is Managing Editor at New Rivers Press, a literary press located on the campus of Minnesota State University Moorhead. Rundquist also teaches writing, editing, and publishing classes at MSU Moorhead. He holds an MFA in Creative Writing from MSUM and a BA in English Education from the University of Indianapolis. His newest publication is a poem forthcoming in Up North Lit.